A unique voting group from the 2016 election -- voters who backed independent Vermont Sen. Bernie Sanders but were willing to vote for Donald Trump -- seems to be non-existent in the early days of the latest presidential contest. A unique voting group from the 2016 election seems to be non-existent in the early days of the latest presidential contest. (CNN) — A unique voting group from the 2016 election — voters who backed independent Vermont Sen. Bernie Sanders but were willing to vote for Donald Trump — seems to be non-existent in the early days of the latest presidential contest. Trump’s June 2015 entrance into the presidential election quickly turned that race from a debate over candidates’ ideology into a question of whether voters wanted a political insider or outsider as the successor to President Barack Obama. Polling before the 2016 election showed a crossover between those who preferred Sanders but would be willing to vote for Trump. A May 2016 poll, during one of the more heated portions of the Democratic primary between Hillary Clinton and Sanders, from ABC and Washington Post found 20% of Sanders voters also supported Trump. Clinton was later able to consolidate Democratic support behind her — another ABC/Washington Post poll released days before November 2016’s vote showed 8% of former Sanders supporters planned to vote for Trump in that election. Even with that consolidation, CNN’s exit polling from the 2016 election showed she lost 8% of Democratic voters to Trump and about 10% of liberal voters — Sanders’ main base of support — also went for Trump. 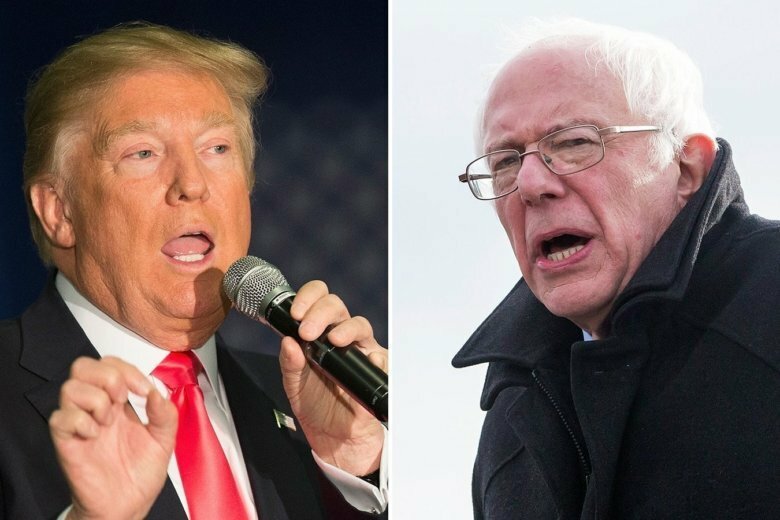 So will there be voters who are torn between the Democratic socialist and the incumbent president in 2020? Early polling suggests not. In CNN’s early February poll, only 5.5% of those polled who said they were very or somewhat likely to vote for Sanders also said the same of Trump. Of possible contenders in the 2020 race, Sanders isn’t the one with the highest overlap on Trump support. Of those who said they were very or somewhat likely to support businessman Howard Schultz, 9.8% said they were likely to support Trump as well. Another 8.7% and 7.7% said the same for Joe Biden and former New York City Mayor Michael Bloomberg, respectively. Biden’s overlap with Trump likely comes from the previous vice president having the highest name identification of any Democratic candidate so far. But for Schultz and Bloomberg, the commonality with Trump appears to be based on their status as wealthy political outsiders. All three men — Trump, Bloomberg and Schultz — are representing different political parties and, to this point, only one has declared for president officially. But, all three have access to extreme wealth and come from a business background. Each of them will try to seize the mantle as the outsider candidate in 2020 and it remains to be seen if that will be as effective a strategy as it was for Trump in 2016.